Yasiel Puig was suspended for two games and received an undisclosed fine after starting a bench-clearing brawl between the Los Angeles Dodgers and San Francisco Giants. Giants catcher Nick Hundley also received an undisclosed fine for his role in Tuesday's fight, although he was not banned following the MLB's announcement on Thursday. The melee started at the bottom of the seventh inning, when Dodgers All-Star Puig fouled off a pitch. Puig and Hundley exchanged words, which caused the former to shove and smack Hundley. The dugouts immediately cleared. 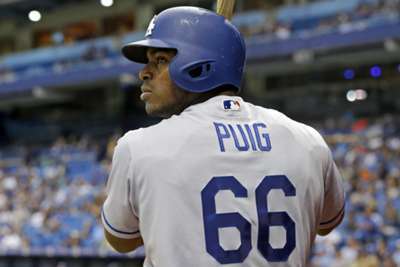 If Puig does not appeal his suspension, it will begin Friday when the Dodgers take on the Seattle Mariners.